Includes data from the Aleutians East Borough, Aleutians West Census Area, and harvesting data from the Chignik and surrounding area. Includes data from the Municipality of Anchorage and Matanuska-Susitna Borough. Includes data from the Bristol Bay and Lake and Peninsula boroughs and the Dillingham Census Area. Includes data from the Kodiak Island Borough. Includes data from the Denali, Fairbanks North Star, North Slope and Northwest Arctic boroughs and the Nome, Southeast Fairbanks and Yukon-Koyukuk census areas. Includes data from the Kenai Peninsula Borough and the Valdez-Cordova Census Area. 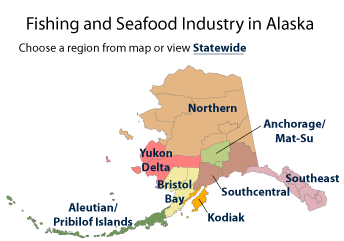 Includes data from the Haines, Juneau, Ketchikan Gateway, Petersburg, Sitka, and Yakutat boroughs and the Hoonah-Angoon, and Prince of Wales-Hyder census areas. Includes data from the Bethel and Kusilvak census areas.